This Short C-23 Sherpa is an Army surplus cargo plane that has been converted for use by the US Forest Service as a “smokejumper” plane – firefighters jump out of a perfectly good airplane into a burning forest! I built this model as a commissioned kit for one of the USFS pilots, including instructions. In December of 2016 the client reached out to BayLUG to ask about having a model made for his commanding officer, who was a LEGO fan and would be retiring soon. I agreed to do it, including making instructions and providing the parts, and started working on the project shortly thereafter. However, real life intervened (my mother’s needed a lot of caregiving, for one thing) and I didn’t have as much time to work on it as I would’ve liked, and it turned out to be a much bigger project than I had initially thought, and I ended up finishing the project just last month. Early unfinished versions of the model were displayed at Bricks by the Bay 2017 and Bricks Cascade 2018 (where it won a Committee’s Choice trophy), and I finally finished the model and instructions in June of 2018. 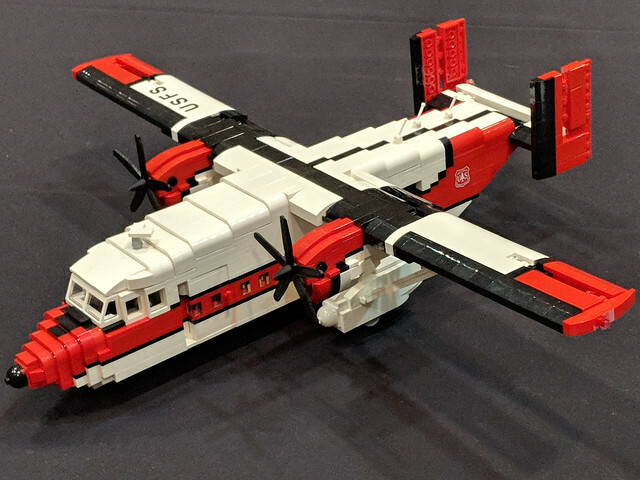 The final model was at Bricks by the Bay 2018. The propellers are 3-D printed, since LEGO doesn’t make a 5-bladed prop. The client provided the 3D print design, made by a friend of his. The USFS lettering and logo was made for me by my friend Dan Kees of PromoTec, printed directly onto LEGO bricks. He also 3D printed the propellers for me. Dan makes the printed bricks for Bricks by the Bay as well, and I was very pleased with the work he did for this project. 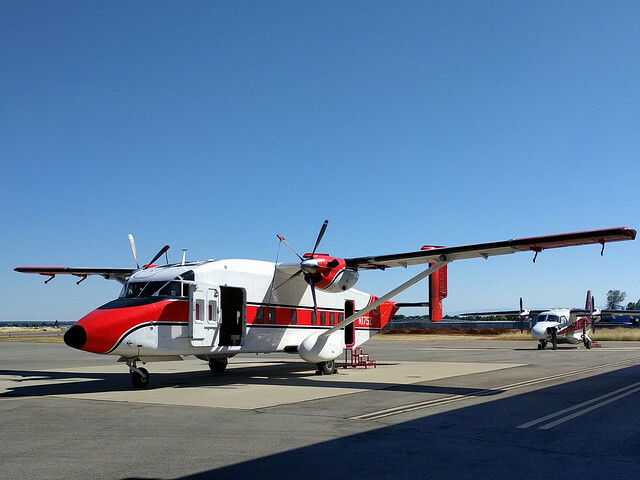 On June 29, 2017 I was able to go visit the Sherpa at the USFS base at the airport in Redding, CA. I was given a tour of the base and the chance to take detailed photos of the planes. The highlights of those photos are also included here. Click the photos in this post to see a full gallery featuring different views of the airplane. Since I made this as a kit with instructions, I’m also happy to say that I can sell additional kits. If you’re interested in building your own kit, I can send you a kit consisting of instructions and parts for $250. I’m also happy to make a grey version to represent the Army plane in its former life. Please contact me if you are interested in either option, or if you’d like to talk about commissioning other kits. Note: This kit is an unofficial model and is not authorized or endorsed by The LEGO Group, the US Forest Service, or Short Brothers plc.